นอกจากหอนาฬิกาแล้ว ยังมีอาคารแอสตัน เว็บ (Aston Webb) อันเป็นหอประชุมของมหาวิทยาลัย ใช้ชื่อตามสถาปนิกคนหลัก (คนรองชื่ออินเกรส เบลล์ (Ingress Bell)) ตัวอาคารสร้างด้วยอิฐแอคคริงตัน (Accrington red brick) ซึ่งเป็นอิฐสีแดงคุณภาพดี แข็งแรง มีชื่อตามสถานที่ผลิตคือ ตำบลแอคคริงตัน จังหวัดแลงคาเชอร์ ด้วยเหตุนี้ มหาวิทยาลัยจึงได้ฉายาว่ามหาวิทยาลัยอิฐแดง (Red Brick universities) ร่วมกับมหาวิทยาลัยอื่นอีกหลายแห่งที่ก่อตั้งในยุคเดียวกัน มหาวิทยาลัยเบอร์มิงแฮมได้รับคำชื่นชมว่า "เป็นมหาวิทยาลัยที่ประกอบด้วยอาคารหลากหลายรูปแบบยิ่ง"
↑ 2.0 2.1 "Mason College". 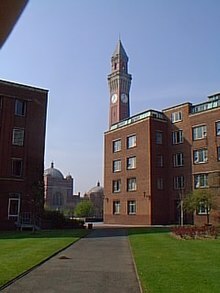 Birmingham University. สืบค้นเมื่อ 9 October 2014. ↑ "History of Medicine Unit – University of Birmingham". Medicine.bham.ac.uk. ↑ Gosden, Peter. "From County College To Civic University, Leeds, 1904." 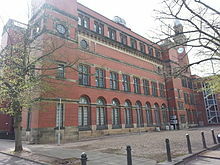 Northern History 42.2 (2005) : 317-328. Academic Search Premier. Web. 12 Nov. 2014. ↑ 8.0 8.1 8.2 8.3 8.4 Hickman, Douglas (1970). Birmingham. Studio Vista Limited. ↑ Ives et al. 2000, p. 342. ↑ Ives et al. 2000, p. 343. ↑ "Norman Haworth - Biographical". Nobelprize.org. The Nobel Foundation. สืบค้นเมื่อ 15 August 2014. ↑ Brown, Laurie M.; Dresden, Max; Hoddeson, Lillian (1989). Pions to Quarks: Particle Physics in the 1950s: Based on a Fermilab Symposium. Cambridge University Press. pp. 167–9. ISBN 0-521-30984-0. ↑ "Peter Medawar - Biographical". Nobelprize.org. The Nobel Foundation. สืบค้นเมื่อ 15 July 2014. ↑ "Our college structure". birmingham.ac.uk. 2015. สืบค้นเมื่อ 29 January 2015. ↑ "Department profile: University of Birmingham, School of Government & Society". Prospects. สืบค้นเมื่อ 25 August 2010. ↑ "Birmingham University, School of Public Policy". The Independent. 21 December 2008. สืบค้นเมื่อ 25 August 2010. ↑ "Archive History Section: The History of the University Observatory". sr.bham.ac.uk. สืบค้นเมื่อ 10 March 2012. ↑ "Astrophysics & Space Research Group :: The University of Birmingham Observatory :: History". สืบค้นเมื่อ 10 March 2012. ↑ "Astrophysics & Space Research Group :: The University of Birmingham Observatory". sr.bham.ac.uk. สืบค้นเมื่อ 29 April 2010. ↑ Burke, Edmund (1900). The Annual Register. Rivingtons. p. 27. ISBN 1-60030-829-5. ↑ Stephens, W.B. (1964). "A History of the County of Warwick: Volume 7". London: Oxford University Press. pp. 43–57. ↑ "Britain's tallest 100 buildings by height". Skyscraper News. สืบค้นเมื่อ 2008-08-09. ↑ Ives et al. 2000, p. 230; Rupert Gunnis, Dictionary of British Sculptors 1660–1851 (1968 revised edition), p.281 identifies it as a 1717 work for Essex Bridge, Dublin. ↑ 30.0 30.1 "Signalling the Sixties: 1960s Architecture in Birmingham". West Midlands: Birmingham.gov.uk. 13 June 2009. สืบค้นเมื่อ 2010-04-29. ↑ Reisz, Matthew (24 September 2009). "Original features". Times Higher Education. สืบค้นเมื่อ 2009-11-08. ↑ Takagi, Dr R. "Muirhead Tower of the University of Birmingham". Takagi-ryo.ac. สืบค้นเมื่อ 2010-04-29. ↑ "New Concert Hall for Birmingham to Open in 2012 on University Campus". สืบค้นเมื่อ 2010-05-19. ↑ "University proposes £175m transformation of historic Edgbaston campus". Birmingham.ac.uk. 9 August 2011. หน้านี้แก้ไขล่าสุดเมื่อวันที่ 8 กุมภาพันธ์ 2558 เวลา 17:50 น.